I love pumpkin pie, but I also love cheesecake. This pie is the best of both worlds – just like my mom’s potato filling (mashed potatoes & stuffing). 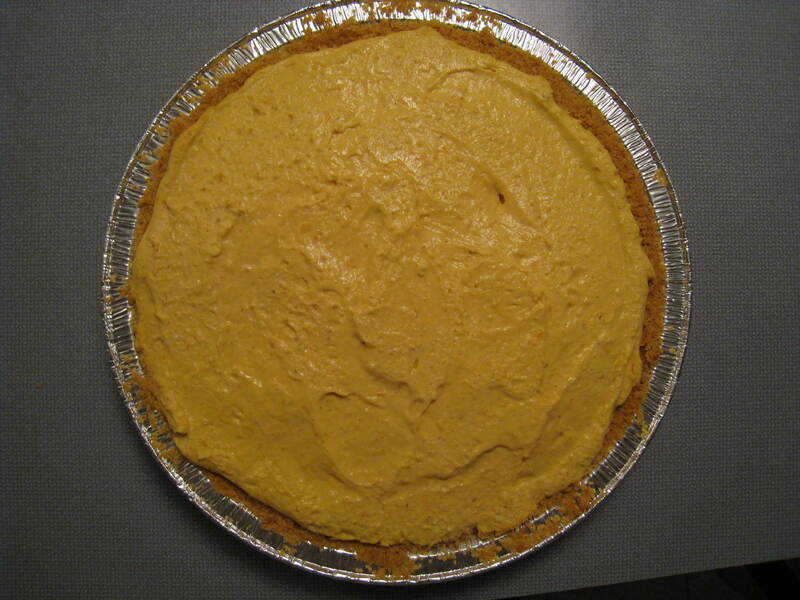 It’s creamy like cheesecake but not as rich and has the pumpkin of a pumpkin pie. It’s also great when your relatives just say MMMM when they eat it. Combine the graham cracker crumbs and powdered sugar. Add the melted butter and combine well. Press into the bottom of a pie pan until firm. Bake for 8 to 10 minutes or until warm and set. Remove from oven and crust to cool completely. In a medium saucepan, mix the pudding mix and half-and-half and cream. Add the spices. Bring to a boil over medium heat stirring constantly until the mixture is bubbly and thick. Remove from heat. Add the pumpkin and stir to combine. Place a lid on the pot an set aside to cool. When cool enough to handle, place the pot in the refrigerator to completely cool. When the pumpkin pudding is cool, remove from the refrigerator. In a mixing bowl, add the additional 1/2 cup of heavy cream and brown sugar. Beat with a hand mixture until light and fluffy. Fold in the pumpkin pudding mixure until combined. Pour into the cooled crust. Cover and refrigerate for at least 4 hours or overnight. Serve with graham crackers crumbled on top.